Welding on a TBM shield. Work at street level above the northern underground segment. Work on the northbound tunnel. Removal of formwork for previously placed interior-wall at Crenshaw/Expo Station. Removal of street curbs and gutter in Park Mesa Heights. 96th Street Station accommodation work. The Crenshaw/LAX Transit Project has reached 53 percent completion, according to Project Director Charles Beauvoir. The projected opening date for the $2.058-billion, 8.5-mile line with eight new stations has been set for October 2019. In the meantime, Harriet the tunnel boring machine has resumed excavation of the second of the twin tunnels for the underground segment at the northern end of the project. The second tunnel will house the northbound tracks with excavation expected to be complete in spring 2017. Harriet finished the southbound tunnel on Oct. 20 when she arrived at the Leimert Park Station box. Walsh/Shea Corridor Constructors (WSCC) is working on the mezzanine floor and has begun to erect walls for several rooms inside the station. Also, work continues installing mechanical, electrical and plumbing elements. Excavation of one of the ventilation shafts is taking place while inside the station construction workers are building the interior walls. Waterproofing of walls is underway. Also, preparation for the portal eye at the north wall of the station continues. The portal eye is where Harriet will enter the station. Waterproofing continues on the lower walls and plumbing is being installed. The south exit portal excavation is almost complete. Leveling and smoothing of the floor is taking place concrete will be poured this month. A press release describing the civil work and street widening with its respective closures has been posted in The Source. Click here for the complete information. The intersection at 67th and Crenshaw Boulevard is being decked and will soon be done. Excavation work continues and should be done early next year. Concrete is being poured for both platform decks and electrical and plumbing elements are being installed. Construction of ballast walls between Fairview Heights, Downtown Inglewood and the I-405 Bridge are underway and water lines are being relocated and drain lines installed. The pedestrian underground tunnel at Faithful Central Bible Church is almost complete. WSCC is working on the stairs, landings and surface finishing and electrical work. The installation of poles for the overhead catenary system continues along this segment and a power substation is being installed that will supply power to the overhead wires. WSCC has completed 95 percent of falsework (framing) for the bridge superstructure. WSCC will begin pouring concrete for the station platform, access ramps and ballast walls this month. The Bridge over Manchester Avenue is done, but WSCC is still working on the wall on the north side of the bridge. Work to accommodate the future 96th Street station is now underway with construction of ballast walls. The superstructure of the bridge is completed and now WSCC is working on the aerial station. Civil and structural work is ongoing and 85 percent complete. WSCC continues installing rebar and placing concrete. Utility and storm drain work is ongoing at the future Southwestern Yard that will serve as maintenance yard for Crenshaw/LAX Line trains. Building electrical and plumbing infrastructure is also being laid beneath the foundation slab and the vehicle lift caissons are being set in place. Main Building foundation forming, rebar installation and concrete placement continues. How We Roll, Dec. 9: what should transit agencies do about fare evaders? Are they using Lightweight Cellular Concrete fill in the MSE Wall? I assume that the baseline is to open the entire line all at one time. 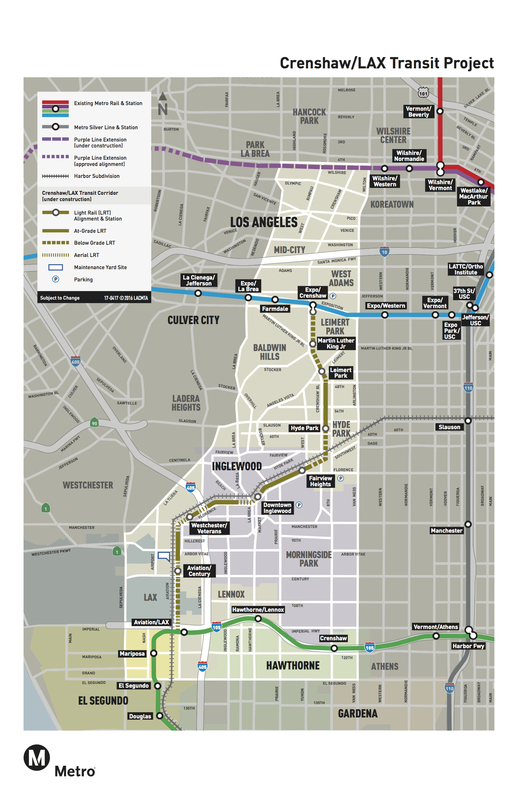 Has anyone thought of focusing on getting the Aviation/LAX to Aviation/Century segment done first and having a shorter route for the LAX G bus?